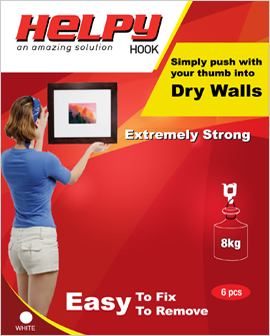 Ensure to fix HELPYhooktm firmly on the Drywall with your thumb . HELPYhooktm is meant to be used only on DRYWALL. ( some users have also used HELPYhooktm on soft wood ). Take adequate precaution while handling fragile and valuable items. The maximum holding capacity of each HELPYhooktm also depends upon the quality and condition of the DRYWALL. Each HELPYhooktm can take a maximum load of 17 lb (8 kg) when an item is hung vertically, parallel to the wall. If the centre of gravity of an item is too far away from the wall due to its inherent bulging shape, the maximum load bearing capacity of the hook may reduce. For extra safety, you may consider chaining 2 hooks which doubles the holding capacity (maximum 34 lb). Keep HELPYhooktm away from small children as you would do with nails screws etc. Store unused HELPYhooktm in a safe place for future use. Limited Warranty : This Gerox product, will be free from defects in material and manufacture. If this product is defective, your exclusive remedy shall be at Gerox's option, replacement of the product or refund of the purchase price. Limitations of Liability : Gerox will not be liable for loss or damage arising from this product, whethet direct, indirect, special, incidental or consequential. Warning : Weight ratings are for comparision purpose only. You must preferably ensure that the weight ratings far exceeds the weight of the object that you wish to hang. The weight bearing capacity of HELPYHOOKTM is maximum when the item is hung vertically, parallel to the wall. If the centre of gravity of an item is too far away from the wall due to its inherent bulging shape, the maximum load bearing capacity of the hook may reduce.